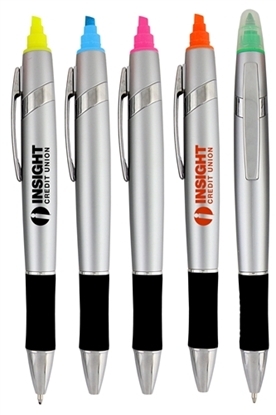 You'll always expand your advertising "turf" with the Divot pen! 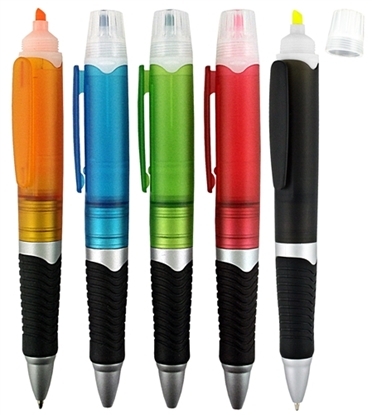 Featuring cool, frosted colors and a unique black grip that make it an unforgettable promotion, this ballpoint pen with a clip has a plunger-action mechanism and black ink with a medium point. Measuring 5 5/8" L x 7/16" D, this fantastic giveaway is a good value that easily promotes your brand everywhere it goes. 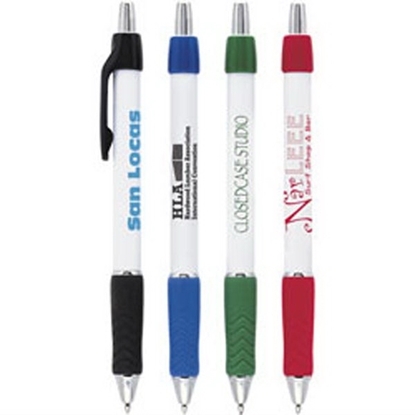 Simply have your logo or message imprinted today! As the name denotes, this pen is a bit thick (or Chubbier, if you will ). Great for your advertising message to stand out with its translucent barrel. Choose a black imprint on the yellow or a silver or white on the other colors. Remember, we can print any color you choose, this is just a recommendation. Black rubber grip with chrome colored accents. 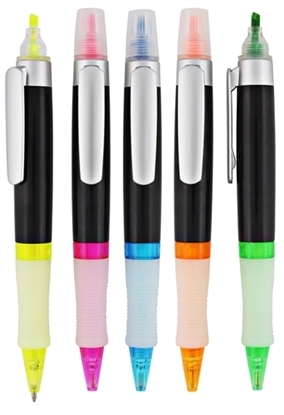 The Nova Highlighter Pen has single color printing in an assortment of colors. Pen highlighter combo. Black barrel with frosted grip and color accents. 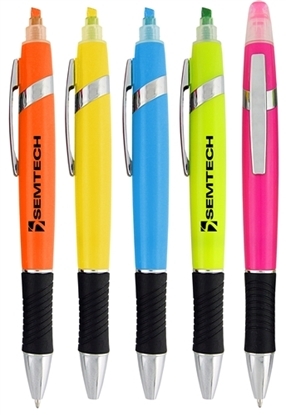 The Baxter Highlighter Pen has single color printing in an assortment of colors. Pen / highlighter combo. Silver barrel with black rubber grip. 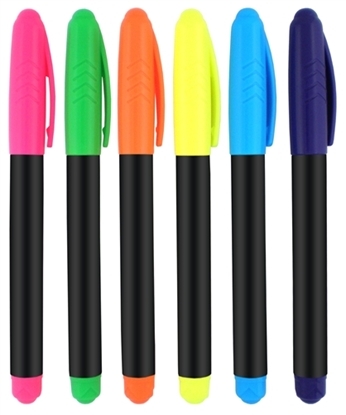 The Brazil Highlighter has single color printing in an assortment of colors. 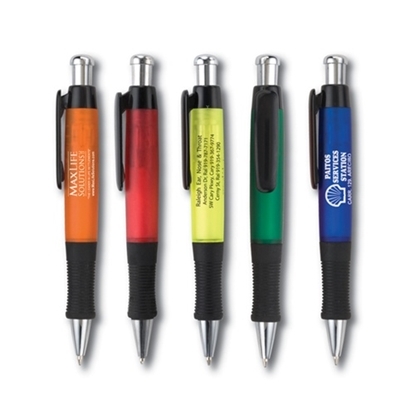 The Bristol Highlighter Pen has single color printing in an assortment of colors. 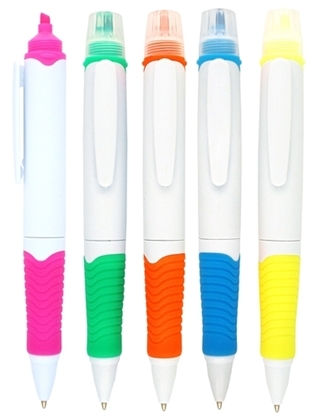 Pen highlighter combo. Silver barrel with rubber grip. 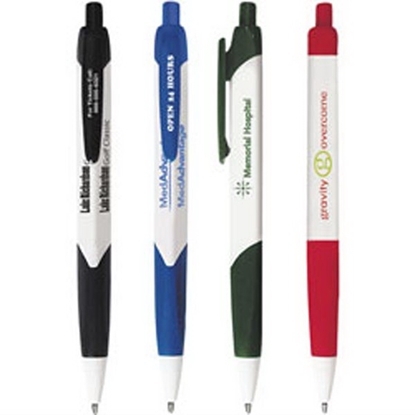 The Tempo Highlighter Pen has single color printing in an assortment of colors. Pen highlighter combo. Black rubber grip and chrome accents. 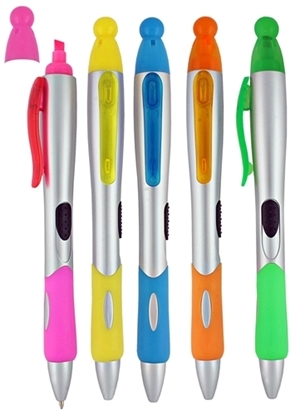 The Galaxy Highlighter Pen has single color printing in an assortment of colors. 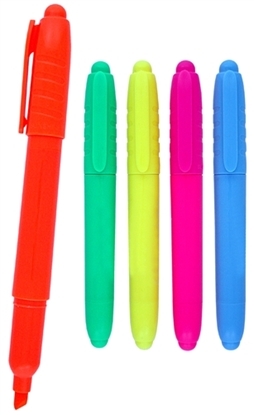 Pen highlighter combo. 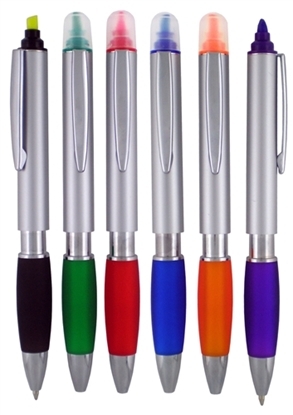 Silver barrel with color rubber grip and accents. 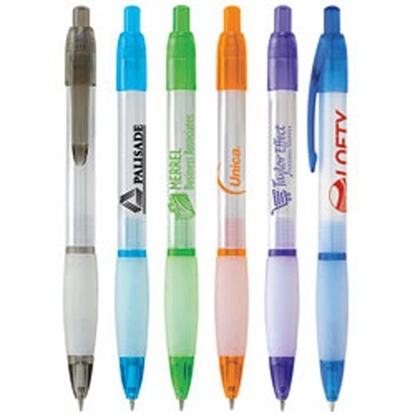 The Madison S Highlighter Pen has single color printing in an assortment of colors. Pen highlighter combo. Silver barrel with black rubber grip. 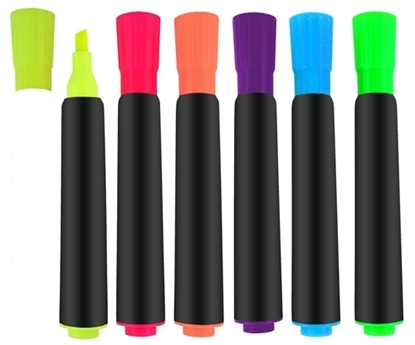 The Madison T Highlighter Pen has single color printing in an assortment of colors. Translucent barrel and highlighter with black rubber grip. 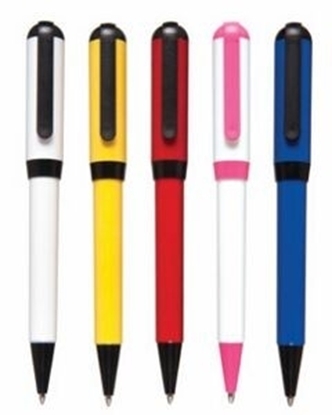 The Madison W Highlighter Pen has single color printing in an assortment of colors. Pen / highlighter combo. White barrel and highlighter. Rubber grip. 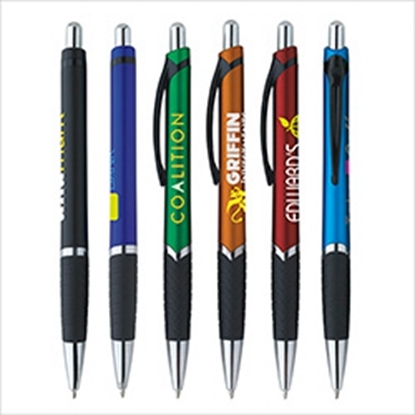 You'll "shed" light -- not skin -- on your campaign message with the Viper ballpoint pen! 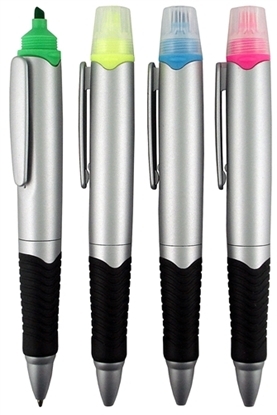 Featuring a white barrel with a colored grip and clip, this plunger-action ballpoint pen has black ink with a Parker-style medium point. Sleek as a viper, this Parker-style pen is impressive. Measuring 5 1/2" L x 3/8" D, this terrific favor gets your brand noticed everywhere it goes. 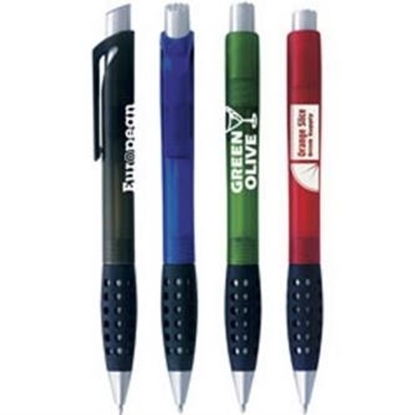 Have your logo or message imprinted on yours now! 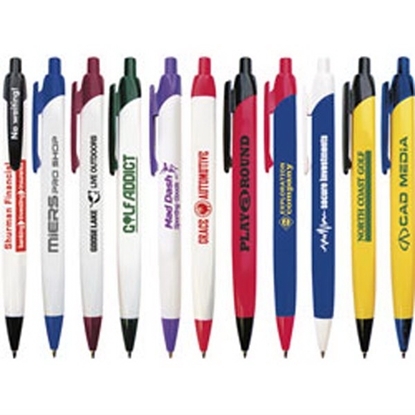 Mypromotionalpens.com offers the largest and best priced selection in Promotional Plastic Pens. We will price compete and we won't be under sold. 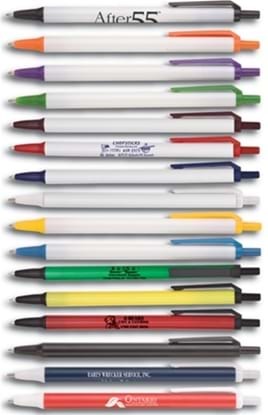 Let our graphic designers make your personalized Plastic Pens standout above the crowd at no charge. We won't stop until you are completely satisfied with your custom Plastic Pens art proof.Use category search filters on your left to help narrow your search to find exactly what you are looking for.